Veal crates are just about the most barbaric contraption still used by a human on another living being. Just the picture of them reminds me of something from a horror sci-fi film. Like an experiment gone terribly wrong. Which it is. And it has. These crates are designed to prohibit exercise - really stop any movement by the calf - and normal muscle growth in order to produce tender “gourmet” veal. The calves are fed a milk substitute that is purposely low in iron so that they will become anemic and their flesh will stay pale. And they suffer like this for 12 -23 weeks. In some manners it makes sense to eat bobby calves - the "waste product" of the dairy industry that are killed anyway at only a few days or a week old. Some dairies now raise these calves for a few months, in sheds on a milk and "low iron" grain, and then sell them to produce veal. It is much better than its counterpart in America. No doubt. Yet taking mammals away from their mothers causes deep distress and keeping them in sheds, not grazing, is still is with-holding from them their most natural of instincts as grazing animals. So yes, we don't "waste" their life because we eat them as the product named "veal" but now their short life is simply a little longer, in which they live a life they can not fulfil their most basic desires. 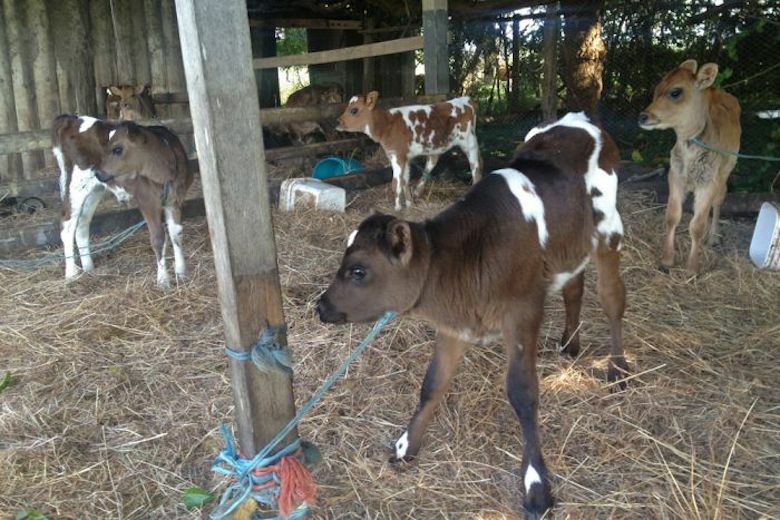 The below photos are examples of raising veal outside of veal crates. How do they sit with you? There is a few places around that rare pasture-raised cattle and kill them younger to sell them as veal and they do this with no space restriction, and not taking them from their mother until slaughter. They still get to be outside, to graze and to be with family. This is the way to go if you must choose veal. If you are outside Australia, and choose to still eat veal, always make a point of asking how it was raised and to not support any farms that use veal crates. The below film is a demonstration of what it is like for the calves stuck in such small spaces... it is distressing and just 30 seconds you will feel why.